Triple Eight Racing Australia boss Roland Dane has elected to split successful Supercars duo Craig Lowndes and Grant McPherson in 2016. Engineer McPherson will run new Red Bull recruit Shane van Gisbergen, as the quick Kiwi looks to take his first championship victory joining the powerhouse team. 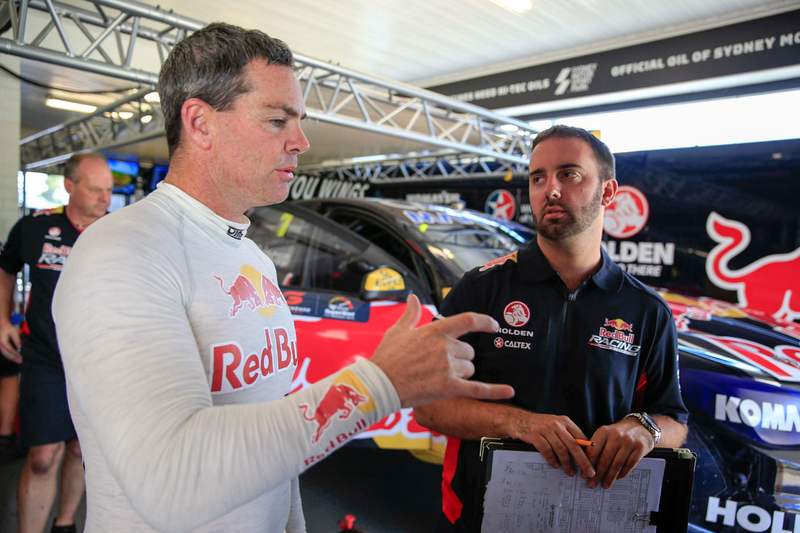 Van Gisbergen lines up alongside six and all-time champion Jamie Whincup in the Red Bull garage, as Lowndes runs Triple Eight’s third Caltex-backed car. After shifting from Prodrive Racing Australia at the end of 2014, McPherson helped Lowndes finish second in the championship, behind his former charge Mark Winterbottom in 2015. Van Gisbergen will be his fourth driver in as many years, after McPherson engineered title contender Will Davison from 2011-13. “Shane will be engineered by Grant,” Dane confirmed. “Grant was torn between wanting to engineer Gizzy and wanting to stay with Craig out of the fact they had a good year last year. And he didn’t know what to do. I made his mind up for him and told him ‘this is what I want you to do’. “With Shane we haven’t worked directly with him yet but I see Grant as somebody who has shown he can work with Mark (Winterbottom) well, he has shown he can work with Davo (Will Davison) well and he worked well with Craig. Dane was complimentary of van Gisbergen’s ability to analyse the car and what was required to improve performance. “From a point of view what we see here, he is someone with a very, very focussed racing brain who can recall what the car is doing at different stages of the day, of a session, of a race etcetera,” he said. “Days later he can go through it and try and give as much feedback as possible and basically provide different data input points from Jamie and Craig who are also providing different input points. McPherson was hopeful he and van Gisbergen could build a relationship quickly, as he was able to with Lowndes last year and challenge for the championship. “Shane is one of the most talented drivers in our sport, so it is incredibly exciting to be working with him in 2016,” McPherson said on the Red Bull Racing Australia website. David Cauchi will continue to engineer Whincup, after finishing last season with the six-time champion.